I love the idea of handing out CD’s for of the upcoming year’s song’s at Christmas time. But, to be honest, as a parent I never even opened them. Not once. And as a Chorister, I feel like they will be getting enough of the program songs during the coming year. So, this year I would love to give a CD of my favorite Primary songs that they’ve probably never heard. Keep in mind that recordings you may own of the Mormon Tabernacle Choir and other LDS artists are in most cases copyrighted and you are not allowed to include them on CD’s that you plan to distribute. Fortunately, though, there are resources with songs you may use. Most of you already know that there are many gorgeous, church-approved songs that don’t appear in the Hymnal or Children’s Songbook. The LDS Music Library has an entire section dedicated to Songs from “the Friend” and the other church magazines. (Make sure to get approval from your Primary President before you teach them) Many do not include recordings, but some of the most popular do! 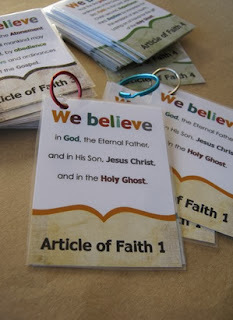 Another idea for Christmas CD’s is to make a recording of the Articles of Faith Songs, The Books in the Book of Mormon, Old Testament and New Testament, and Latter-day Prophets. Those are all available to download here. My children learned their AofF without a minute of studying because we listened to a CD like this one in the car on the way to and from school. The Articles of Faith, Books and Prophets CD might also be a good idea for a Baptism Gift, as the children are getting ready to learn the Articles of Faith for their Faith in God requirements! Any other great ideas? Leave them in the comments!